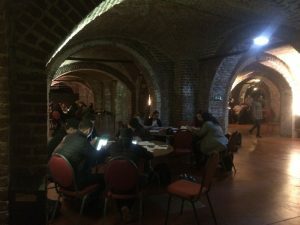 With this post I want to share our experiences, our mistakes, what we’ve learned from it and hopefully provide you with some tips and tricks that may help you when working with Digital Storytelling with youngsters. An enchanting place, a huge cellar more than 100 years old. It was once used for growing mushrooms last century and has now become a popular venue for events. The students came from two Flemish Dutch-speaking schools in Brussels: Anneessens Funck and GO for business De Toverfluit. 9th and 10th grade. These are schools with a super diverse public: youngsters from all backgrounds, some of them born here, others just arrived two years ago. The Dutch language is one of the big challenges for these students, since it is rarely their mother language. It is their second, third or even fourth language. Formal classical education is a rough path for most of them and by the age of 16-17, motivation for going to school is on a low level. Instead of having 4 to 5 sessions of 4 hours, we made it very compact to get sooner to the concrete action, something we’ve noticed is necessary in previous workshops with our target group. For this day, we decided to mix and divide all students into 6 different groups each with their own topic related to GCE: Family, friends, lifestyle, habitat, my future and my history. The idea was to start from the student and his environment and to make a link with GCE in a second phase. After a quick introduction of the day, we started in our different groups. Trainers and teachers guided the youngsters through the day. 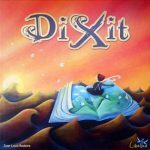 It started with a round of Dixit where all cards are on a table and everyone has to pick a card which he/she likes or can relate to. Afterwards everyone tells why he/she picked this particular card. I’ll have to be honest: these youngsters 16-17 years old are not very eager to talk about themselves in a group. As a trainer, you constantly have to try and motivate them, ask questions, more questions and more questions. Even though we tried to make GCE close to the student and the time framing very compact, lacking motivation was a huge challenge this day. How to motivate and involve the students into GCE and Digital Storytelling was really the key question of this day. After our round of Dixit we went to the topic of each group. We prepared some questions, each student had about half an hour to think about these questions and to answer them. This exercise was not about writing, spelling or grammar, it served merely as a starting point for our story circle afterwards. Not only talking in group but also listening to each other is not easy. It demanded great effort from trainers and teachers and from students as well. After this, we went back to our different groups and each student received an iPad to start making their own digital story. This part of the process went easier, students could work individual on a tablet and a concrete result came out of it. They used their drawings and pictures from the internet for their stories, they recorded their voice and edited all on their iPad. But it is the content they had to come up with during the morning session which can seem too abstract, that made it possible to create a digital story this fast. It stays hard to get the attention of students for GCE. As a trainer you have to stay motivated all the time even if you receive little to no feedback at the beginning. Eventually interesting ideas and stories will come out. It is not easy for the youngsters we worked with to share their opinion in a group. The location was not ideal: the huge cellars were a temptation for the youngsters to wonder around instead of focusing on their digital story. Working with specific themes within the frame of GCE works well. It makes it easier to focus. But one should keep the possibility open to open up the themes if the group wants this. Preparing questions in advance is very important. It’s the trainer’s guide for the story circle. Also make sure to have more questions in your head you can ask during the story circle. These questions will inspire others in the circle as well. Be prepared on the technical level. Our colleagues from the technical department went one day in advance to install extra Wi-Fi-routers. All iPads were charged, and every iPad had the proper logos and proper credits already installed. And to come back to the beginning: did we reach our goal of having all students make their own digital story? Almost, but not completely. We, the students, teachers and trainers, did a very good job! But for a couple of students it did not work out. Where this one-day workshop formula worked in many ways, it also has the disadvantage of not being able to make time for students who need extra attention or guidance. And anyone can have a bad day, not only youngsters. After all, we’re not only Global Citizens, we’re all humans in the first place. We continue to work with Digital Storytelling. We keep believing it is a very good way to reach youngsters, to inspire conversations, to have discussions, to share stories. I am very curious to hear from other trainers and teachers from all over the world: what are your thoughts and experiences? What are do’s and don’ts ?